The people’s protest movement came to Charmouth this morning. Nobody threw any stones or fire extinguishers. The Dorset police did not even turn up, so no-one was injured by kettleing tactics. 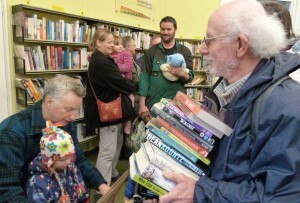 True, there were not thousands on The Street, but the library was full to overflowing. 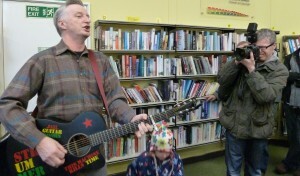 Attendance was helped by the presence of Billy Bragg, who lives in the neighbouring village of Burton Bradstock. He came along with his guitar and sang a few of his songs, including the Battle for Barking, which celebrates, amongst other events, that day in Cable Street in the 1930’s when London’s east enders took to the streets to protest against fascism. He also made a rousing speech, which captivated his audience, quite as much as his songs. If only Ed Miliband, our shadow prime minister, could speak half as well, the national campaign to save public libraries would be un-stoppable. In his speech, Bragg linked the library protest with the American civil rights movement of the 1950s and with the current student protests over tuition fees. He proclaimed his commitment to a caring society, which enabled poor boys like him, to gain free access to the rich diversity of our culture, books as well as music. And he thanked the post-war Attlee government for providing them, along with free health care via the National Health Act. In fact, we owe our public libraries, to one William Ewart, a Liberal MP, who introduced the Public Libraries Act in 1850. The Act was only passed after two years of acrimonious debate in committee and on the floor of the House of Commons. Ewart had to face opposition from the Conservatives, but also from several in his own party. The main argument against was that it was taxation without consent. But for the poor boys of the 1850s libraries were useless, because the vast majority of them could not read and write properly. That was not rectified for another thirty years and it was rectified by the education reforms of Disraeli’s Conservative government, ushering in free schooling. William Ewart, was not a poor boy, like Nye Bevan. He was educated, like Cameron, Letwin and that other great compassionate Conservative they admire, Harold Macmillan, at Eton and Oxford. So they should both pop into their local libraries this weekend, take out decent biogs of Disreali and Macmillan, and refresh their memories on what compassionate Conservatism is all about. They now think that a Dutchman was the killer. But their former suspect, pilloried by the media, with the help of police ‘leaks’, is still held, althouhgh on bail. His reputation in shatters. Do they think he was an accomplice, of the man, they now think wars the murderer? If not, why do they not clear him, and try and make amends for the damage to his reputation, resulting from the press coverage, fuelled by police leaks. The police have a difficult job. There is a huge public need to find the villain. Fuelled by the press. But unless the police think that the Dutchman was acting in conspiracy with their first suspect, they should release him from arrest on bai9l. And, even also say, Sorry.